ALL TEAMS MUST RUN TWO ROUNDS TO QUALIFY FOR THE WORLD FINALS. In the Toss and Catch round, competitors are given 60 seconds in which to complete as many throws as possible with one disc. The canine and the thrower must be behind the line before time starts. When the thrower indicates that he or she is ready, the line judge will signal to the announcer that the competitor is ready. At this time, the announcer will count down, "3-2-1-GO," and will simultaneously start the clock with the word "GO." Throwers must be behind the line for all throws, but they may move around the field freely between throws. If the thrower steps on or across the throwing line at the time of the release of the disc, the throw will not be scored. Countdown of time remaining will be given at 30 seconds, 10 seconds, 5, 4, 3, 2, 1, and time. Completions will be scored as long as the disc leaves the thrower's hand prior to or simultaneous with the call of time. The competitor may only have one disc in his or her hand at any time during the Toss and Catch round, but may bring one additional disc to the throwing line, which must be handed to the line judge before the round begins. If, during a round, the competitor believes the disc in use has become unsafe for the dog to catch because of a broken rim or a large tear, the disc may be handed to the line judge and exchanged for the second disc provided by the competitor. The damaged disc must be handed to the line judge before a replacement is given, and time will not be suspended during a disc change. 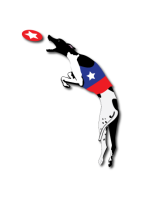 Out of this years Toss and Catch Division, the top 4 teams from each AWI Qualifier in the US will qualify for The Ashley Whippet Toss and Catch World Championships and at the International AWI Qualifiers, the top 5 teams from the Toss and Catch Division will qualify for The Ashley Whippet Toss and Catch World Championships. At all Qualifiers, every team will run two rounds of Toss and Catch and those two scores will be added up. The top 4 teams with the top highest combined rounds will qualify. If per chance a large group enters at a Qualifier to participate , and time or fields are limited to accomplish two rounds each , it will be up to the event coordinator or head judge to make a cut to the top 10 or 15 teams that can do a second round. Tie breaker rules are in the General Competition link on The AWI website. There will NOT be a cash prize during The World Championship . There WILL be a cash prize at the Last Chance event. The field will be 50 yards/ 45.5 meter in length, and players may choose to throw from either side. The field will be divided into five segments, with the first being 10 yards and all others being 10 yards,too. 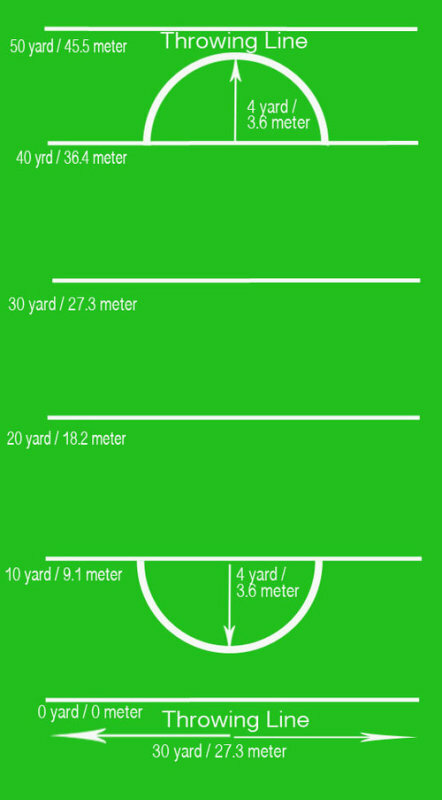 The width of the field will be 30 yards / 27.3 meter. Low profile cones will be placed 20 yards apart along the edge of the field. There will be no out-of-bounds along the sides or on the ends of the field. *** A bonus half circle measuring 4 yards in radius will be painted at each end of the field with the center of the half circle at the 40 yards line. The field is set up so that competitors have a choice to throw from either end of the field; however, the throwing direction cannot be changed once time has started. Competitors will enter and exit the field through the same gate, and should use whichever gate is closest to the throwing line the competitor wishes to throw from. 0.5 Accuracy Bonus Point: A dog's trailing paw or paws may be on the 40 yard line but all other paws must be beyond the 40 yard line with at least one paw completely inside or on any part of the line of the accuracy bonus half circle at the time the dog makes the catch or upon landing after a catch is made in the air. Continuing this year we will expand the Toss and Catch scoring here in the U. S .
This will be for any and all toss and catch rounds including Recreational (non-qualifying) and Open (qualifying) divisions. While a team is doing their toss and catch rounds and land a throw in the Bonus Zone, they will get the 2.5 as the rules state. BUT, now we want to step things up some. After the first Bonus Zone (BZ) throw of 2.5, we want to add an extra.5 point for any BZ throw after that in each round. 4th throw is another bonus zone, = 3.0 pts. 5th throw is another bonus zone = 3.5 pts. = total of 11 points . So you would get an extra .5 pts for every additional bonus throw you make in that one round . This will include all rounds thrown. We no longer award any bonus point for "in the air" catches. Completions will be spotted in the zone where the trailing paw of the dog is located at the time of the catch. If the dog is in the air at the time of the catch, the completion will be spotted where the trailing paw of the dog is located when the dog lands. The trailing paw / paws , must be on or across the line to score in the forward / higher zone . If any part of the trailing paw is touching behind the scoring line, the catch will be scored in the lower scoring zone.